Mike Mitchell was a strapping 6'1", 185-pound right fielder with speed, power, and, according to noted baseball historian Bill James, the best outfield arm of the Deadball Era's first decade. 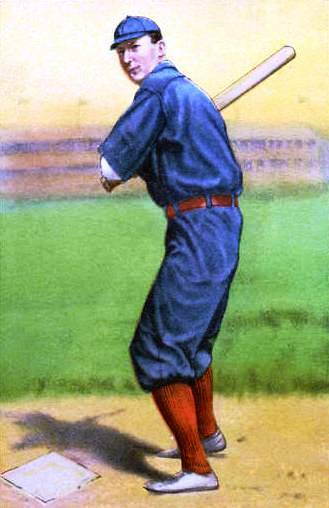 In addition to stealing 107 bases from 1909 to 1911, Mitchell led the National League in outfield assists in 1907 and triples in 1909 and 1910. The right-handed hitter and thrower with a career slugging percentage of .380 led the Cincinnati Reds in slugging in 1907 and each year from 1909 to 1911. "Mitchell is probably the heaviest hitter in the National, a name which he was won because of his liking for nailing out three baggers and home runs just when a hit is needed," wrote Alfred Spink in 1910. "He is a splendid fielder, fast as lightning on the bases, and can throw with the best of them." Though Mitchell lasted just eight seasons in the majors, six of them with Cincinnati, James ranked him as the 108th best right fielder of all time. Michael Francis Mitchell was born on December 12, 1879, in Springfield, Ohio, about 65 miles northeast of Cincinnati. He was already 22 by the time he joined an independent team from Schenectady, New York, in 1902. Mike played well enough to earn a 12-game tryout that September with Toledo of the American Association, slugging a home run and a pair of triples among his dozen hits. He remained in Organized Baseball with Troy of the New York State League in 1903, and the following year he split the season between Newark of the Eastern League and Syracuse of the NYSL. According to sportswriter Hugh Fullerton, University of Illinois athletic director George Huff, scouting for the Chicago Cubs, went to Syracuse that summer looking for an outfielder and discovered both Mitchell and Frank Schulte. "Both were secured, but Chicago offered Mitchell less money than he was getting at Syracuse," wrote Fullerton. "He was forced to accept the offer, but openly stated he would not give his best efforts to the club, and so was lost to Chicago." In 1905 Mitchell joined Portland of the Pacific Coast League and batted .251 in 147 games, giving little indication of the performance that was soon to come. In 1906 he put together one of the greatest minor-league seasons of the Deadball Era, raising his batting average 100 points to win the PCL batting championship, and collecting 31 doubles, 12 triples, and a league-leading six homers to help Portland cop the pennant. With numbers like those, Cincinnati manager Ned Hanlon thought that Mike might provide the big bat that had been missing from the middle of his lineup since the Reds had sold Cy Seymour to the New York Giants. In his major league debut on April 11, 1907, Mitchell went 3-for-4 with a triple to lead the Reds to a 4-3 victory over the Pittsburgh Pirates. It was the beginning of a season that would earn him STATS, Inc.'s retroactive Rookie of the Year award. The 27-year-old freshman finished fifth in the NL in hits (163), sixth in triples (12) and total bases (213), and seventh in batting average (.292). Mitchell demonstrated his athleticism on September 10, 1907, earning a gold medal and $100 during a field day in Cincinnati by winning the fungo-hitting contest; his mark of 413', 8 1/2" was considered the world record until Ed Walsh swatted one 419'. Mitchell also set a record in 1907 for assists by an outfielder with 39, which stood until Chuck Klein gunned down 44 base runners in 1930. After his rookie year Mike's assist total never exceeded 23, but by then National League opponents knew better than to challenge his rifle arm. Right field at the Palace of the Fans was a notorious sun field, and Mike reportedly made one putout when a high fly that he'd lost in the sun struck him in the chest, bounced off, rolled down his arm and into his hand. Luck turned against him in 1908, however. Limited by injury to 119 games, Mitchell slumped to a .222 batting average with just one home run, a game-winner in the 10th inning against Brooklyn on August 15. Mitchell bounced back in 1909 to record his best season in the majors. In addition to his league-leading 17 triples, he ranked second in the NL in batting (.310) and slugging (.430), fourth in RBI (86) and total bases (225), fifth in on-base percentage (.378), and sixth in hits (162) and stolen bases (37). Mike maintained his outstanding performance in 1910, blasting a league-leading 18 triples, ranking second in RBI (88), and appearing in all 156 games. The following year he was even better, batting .291 with career highs in doubles (22) and triples (22), the latter figure placing him second in the NL behind Larry Doyle's 25. Mike's greatest game in the majors came on August 19, 1911, in the second game of a doubleheader against the New York Giants. In front of a crowd of 35,000 at the Polo Grounds, Mitchell had four extra base hits, stroking three of his hits against the great Christy Mathewson. His stellar performance helped Cincinnati beat New York, 7-4, snapping Matty's personal 22-game winning streak against the Reds that dated back to June 1908. Though he was only 32 years old at the start of the 1912 season, Mitchell's best seasons were behind him. That year, his last with the Reds, he batted .283 and saw his production drop off in just about every statistical category. In December Mike became the key Cincinnati player in the blockbuster, eight-player trade in which the Reds acquired Joe Tinker from the Chicago Cubs. Mitchell's career went into serious decline after leaving Cincinnati. In 1913 he switched to left field because the Cubs had their own strong-armed right fielder in Frank Schulte, Mike's old minor-league teammate. Mitchell got off to a decent start in Chicago, batting .262 with four home runs and 15 stolen bases in 82 games, but on July 29 the Cubs placed him on waivers and the Pittsburgh Pirates claimed him. Fred Clarke played him in center field between Max Carey and Owen Wilson, and he finished out the season by hitting .271 in 54 games. After his career in baseball, Mike Mitchell managed pari-mutuel machines at several racetracks in the Midwest and West before retiring to Phoenix in 1954. He was 83 when he passed away in Phoenix on July 16, 1961. The material for this article came mainly from The New Bill James Historical Baseball Abstract (The Free Press, 2001); Alfred H. Spink's The National Game, second edition (2000 reprint edition from Southern Illinois University Press); and Bill Lee's The Baseball Necrology (McFarland & Co., 2003); plus The Sporting News and Sporting Life.